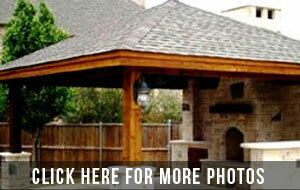 For over twenty years, Patio Creations has been constructing patio covers to outdoor spaces in Sugar Land. A quick browse into our patio cover gallery will show you a wide variety of patio cover projects that we have built over the years. With a patio cover upgrade, a simple patio can be transformed into a more comfortable and pleasing area. With a low-cost patio cover, you can increase the quality of your outdoor living space and still stay within your budget. Our meticulous experts will ensure that your patio cover fits seamlessly into your home and that it will last a lifetime. While most patio cover installations simply mean extending your existing roofline, we include a weatherproofing service that makes your patio cover sturdier and longer lasting. Patio Creations has constructed both lattice and solid patio cover styles. We are also able to do a combination of both lattice and solid upon request. When installing your patio cover, we make sure to consider the other features you might want such as outdoor lighting, ceiling fans, outlets, and cover design. Aside from patio covers, we also install other outdoor structures and features such as kitchens, fire pits, ponds, and fountains. To learn more about our work, call us today for a free, no-obligation consultation!